The dog is man’s best friend. Diamonds are a girl’s best friend. Ben is Jerry’s best friend. You get the picture. In the spirit of platonic pairings, I propose that a runner’s best friend is his or her … drum roll, please … iPod. Shoes are a poor BF candidate, unless you walk on and discard your BF for the next one every four months. And your GPS is all work and no play. Not ready to accept the iPod into your friends network just yet? I invite you to walk a mile—actually, to run a certain ten miles—with me. You may change your, um, tune. It was a blustery Sunday of 35 mile per hour winds, plummeting temperatures and the threat of snow, unpleasant enough to make me fathom the unfathomable: ten miles of long-run-paced plodding on my gym’s treadmill. The thought makes me shudder still. This was the runner’s equivalent of doing hard time. Putting the unsavory task off until the last minute, I found myself among a throng of others serving a like sentence. There was but one available treadmill. Perfect! I hopped on the belt and got after it. I futzed with the control panel and quickly revved to plodding speed. I was warming to the task. Time to settle in, relax, and leave the hard work to the pilot. I’d be landing on terra firma in an hour and a half. Baggage claim was just feet away, in a cubby. Parking wouldn’t cost a penny. Piece of cake. Was I the victim of epic technological failure or of my own woeful planning? Either way, that day I discovered who my true friend was: my iPod. Absence had made this heart grow fonder. And if your iPod isn’t just the friend you want, you have only yourself to blame (ok, and maybe Steve Jobs, a little). With some thought, you can make your iPod anything you want him or her to be. What friend can you say that of? Before I continue with this ode to the iPod, allow me to get a few preliminaries out of the way. Like your BFF in high school, your iPod can sometimes get you into trouble. First, your iPod is a friend who, you may discover, is not welcome at races. It’s nothing personal. It’s just that there’s a lot happening at races (we are talking about hundreds—or thousands—of people running as fast as they can, after all), and race directors and volunteers want you to be optimally aware of your surroundings and of their directions. Please respect their wishes, and don’t attempt to smuggle your friend into an iPod-prohibited race by hiding your headphones in a hoodie or some such contraband-concealing piece of headwear. You may be disqualified (and get really hot). Anyway, the last thing you should be at a race is either bored or lacking motivation. 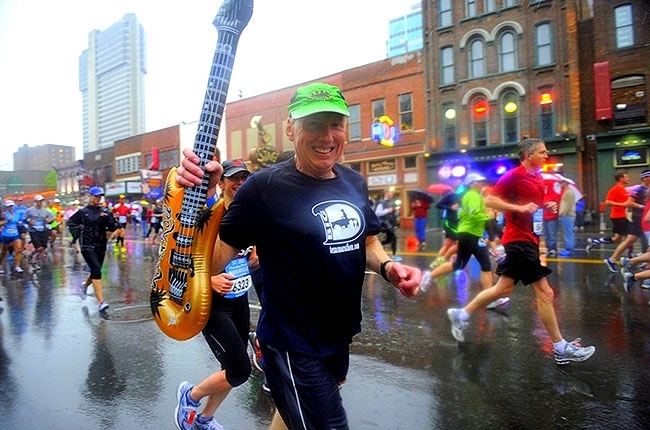 You may even find music an overwhelming irritant late in a race. Second, I don’t recommend running unfamiliar trails, streets or neighborhoods while tuned in. Only after you are well-acquainted with all that a course may throw at you, is it advisable to crank up the volume. Palmer Park, for example, is as popular with mountain bikers as it is with runners. Much of its 25-mile trail network consists of deeply-rutted, scrub-oak lined single track. Running with an iPod, I’ve been caught unawares by rapidly approaching mountain bikers, and averted head-on collisions with them by the slimmest of margins, leaving both them and me shaken. If you simply must have your friend with you, at least hit his/her hush button when confronting blind corners, limited visibility or creepy underpasses reminiscent of horror movie sets. Third, Eine Kleine Nachtmusik (A Little Night Music) may make your “easy miles” playlist, but I recommend leaving the iPod at home after dark. With one of your senses already compromised (your sight), your disadvantage is doubled when you can’t hear if something goes bump in the night. Tune in next month, when we celebrate our BFF the iPod, and explore the “science” of composing the perfect running playlist.